info@mdmarchive.co.uk with 'Musical Adventures' in the subject field. 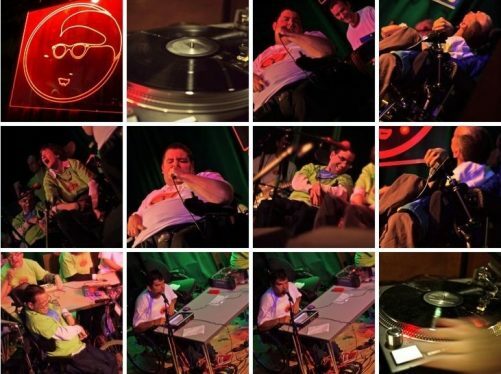 The Prospectors are a 12-strong band of disabled musicians who have been playing and gigging in and around Manchester for over eight years. Led by Drake Music’s Fil Hill and Andy Boothman, the group uses a complex combination of Soundbeam, iPads, Ableton and live instrumentation to create experimental reworks of pop and dance classics. For one night only The Prospectors will be joined by Manchester rave pioneer Graham Massey (808 State/Massonix/Toolshed) for a set of tracks inspired by music from our fair city. Nice Touch are a collective of young disabled musicians from Bolton who have been making music with collaborator Kenton Mann (Music Unlimited) since June of last year. The band work on original material and aim to spread joy wherever they go. Tonight will be their Manchester debut. Bernie Shaw is the artistic leader of legendary Swinton ukele collective Strummers & Grinners.Tonight he presents four spin-off ukele ensembles: Cool Hand Uke, Jo Bangles, Ladies In Red, Banjojo for a right royal knees-up, Salford-style. Compere Longfella is one of the UK’s most renowned performance poets and an all-round Manchester hero. DJ support on the night comes from All FM’s Vicky Richardson & MDMArchive’s Abigail Ward. Stockport Cerebral Palsy Society – a charity that promotes independence for children and adults with physical and/or learning disabilities; Drake Music – a charity that removes disabling barriers to music; and Manchester College. Admission is free. Please register for guest list places by emailing: info@mdmarchive.co.uk with ‘Musical Adventures’ in the subject field.